Chances are that we have all watched a high-speed chase unfold on TV at some point. Chases are cool in the movies, but in the real world there is a very, very real chance that the people running from the cops will end up killing innocents in the accidents that most often happen during these chases. 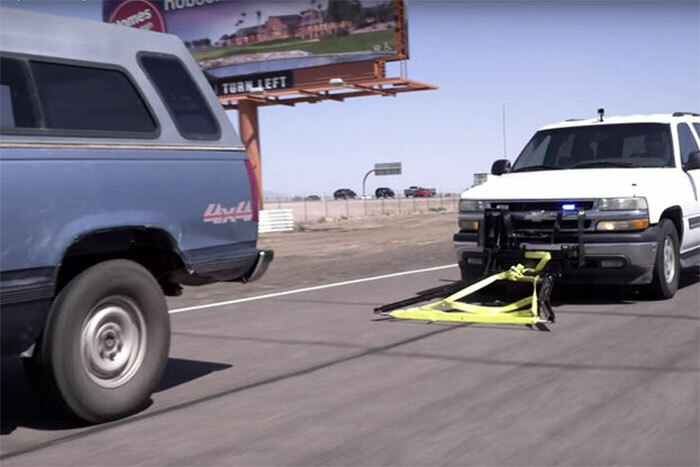 A new device has been invented that will give police a way to end high-speed chases more quickly and safely. The device is called the Grappler and it is essentially a net that winds its way around the tires and axle of the fleeing car to stop it cold. The inventor of the device has been developing it for a number of years and it is finally ready to enter the market. Exactly how much the device will cost is unknown, but many will agree that saving one life will justify the cost for police. Pricing will be announced on November 23. Videos showing the device in action show it working on multiple vehicle types on multiple types of road surfaces.